Do you work in the care industry and are looking for ways to improve and update your knowledge? If so, a care home exhibition from Care Roadshows could be the event for you. We provide free regional care events throughout the UK that inform, inspire and improve everyone working in the care sector. To find out more and register your place, please call us today on 01425 838393. Care Roadshows are a series of free care home events held regionally in the UK to inform and inspire care home managers and owners along with those working in the sector. You’ll be joined by care suppliers, industry experts, and other care professionals to discover innovative products and services. In addition, you will get the latest updates and ideas from this industry by taking part in free seminars and workshops. Our care home exhibition is available for people working in the care sector. From care home owners and managers, social services executives, and care providers to healthcare professionals, everyone is sure to learn something new. There are many reasons you can benefit from attending one of our care home events, such as gaining free information and advice from experts. You’ll have access to many ‘try before you buy’ products and special deals only found at our shows. Our one day care home exhibition offers visitors the perfect opportunity to interact with dedicated suppliers, source the latest products and services while networking with peers and professionals. It is the ideal platform to engage with your target market face-to-face and offers maximum exposure to high-quality leads and new business opportunities. We offer a choice of two packages for people exhibiting at one of our shows. These are standard and affiliate packages, with free pre-show promotion, included in your stand package. We are always on the lookout for speakers to take part in our educational seminars and workshops. Each seminar is 30 minutes and anyone speaking must cover current issues and topics within the care sector. These sessions should be informational, inspirational, and educational while not being sales based. Our workshops are hands-on, interactive events that must provide visitors with new inspiring ideas and not be sales based. Care Roadshows are a series of regionally held care home exhibitions and events that inform and inspire people in the care sector. You’ll join a variety of care suppliers, industry experts, and care providers in discovering innovative products and services. In addition, you will also get the latest updates and ideas from this industry and be able to take part in seminars and workshops. A care home exhibition through us is open to people working in the care sector. 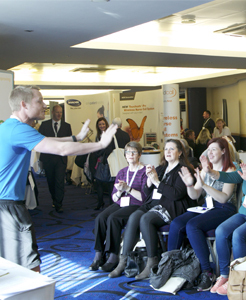 From care home managers, healthcare professionals, and care providers to social services executives, everyone is sure to learn something new at our shows. We offer free entry, seminars, workshops, and parking plus a free £100 prize draw so there is nothing to lose by coming out to one of our care home events. With events taking place in locations across the UK such as Cardiff, London, and Liverpool, you are sure to be able to attend our care home exhibition. If you would like more information about the care home exhibition we offer, please contact us today on 01425 838393. Alternatively, for information or to book your place as an exhibitor or speaker, you can fill out the form on our site and we will get back to you.